I created this card last week for the CAS challenge on Spitcoast, the CAS-ual Friday challenge and that week’s CAS(E) this Sketch!. I started by cutting three leaves with the new MFT Falling Leaves Die-namic dies out of 7 Gypsies Conservatory paper. The edges of the leaves were sponged with Vintage Photo Distress Ink, layered together with foam adhesive squares and tied on top with black embroidery thread. The bottom right and top left of a 3″ x 5″ piece of Teresa Collins Spring Fling patterned paper were rounded, the edges were sanded and the paper was stitched to a 1/8″ bigger piece of black cardstock. The layers were adhered to the card base, a 3 1/2″ x 11″ piece of Kraft cardstock folded in half. A sentiment from the new Falling Leaves stamp set was stamped in Jet Black Archival ink on the bottom right of the card. The leaves were adhered to the upper right hand side of the card. Black Baby Bling Rhinestones were adhered above and underneath the leaves to finish off that card. I created this card for a CAS challenge at Splitcoaststampers. I had seen one of Debby Hughes cards (I am a big fan) and saw a layout I just had to case! I started by cutting one edge of a 3 1/2″ x 5 1/2″ piece of Neenah Solar White cardstock with MFT’s Notebook Edge Die-namics die. A piece of My Mind’s Eye Six by Six Gnome Sweet Gnome paper was adhered behind it to form a 4 1/4″ x 5 1/2″ card front. A button was tied on with hemp cord on the upper corner before the layer was adhered to the card base, a 4 1/4″ x 11″ piece of Kraft cardstock, folded in half. The bottom corners were rounded and a leaf from JustRite Stampers Shabby Chic Autumn Leaves was stamped on the lower right corner with Peanut Brittle Memento Ink. A sentiment and postage stamp image were stamped over it with with Jet Black Archival ink. Three black rhinestones on the top right finish off the card. 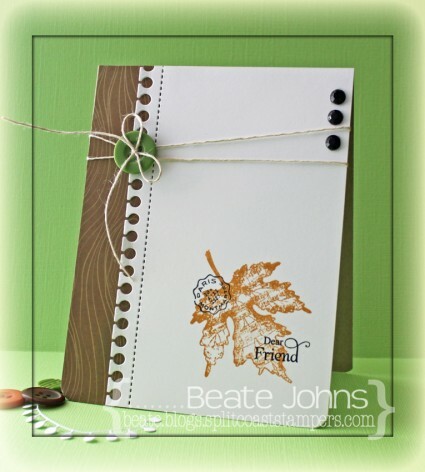 This card works perfectly for the newest Simon Says Stamp Challenge which is called Autumn Leaves. I hope you have time to participate. You could win a $50 shopping spree at Simon Says Stamp online store. I LOVE Simon Says Stamp. 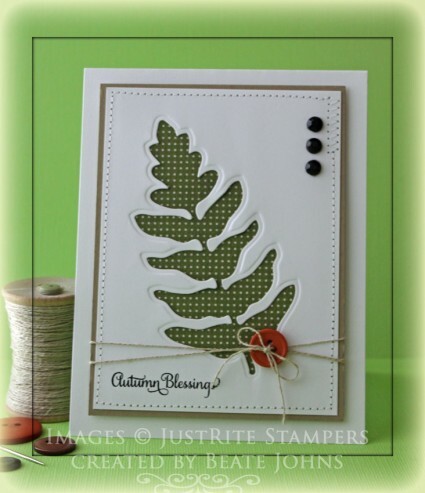 I created this card for a Free For all Challenge on Splitcoaststampers. We were to create a card with fall leaves. I had seen so many negative die cuts on Pinterest and love the look. I decided to create a card like that for this challenge. A piece of 3 1/2″ x 4 3/4″ piece of Neenah Solar White cardstock and cut and embossed with one of the Spellbinders Foliage dies. A piece of BBP All Hallow’s Eve patterned paper was adhered behind it before the layers were stitched to a 3/16″ bigger piece of Kraft cardstock. A sentiment from JustRite Stamper’s Antique Autumn Tags One was stamped in Jet Black Archival Ink to the lower left of the layers. 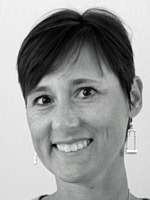 A button was tied on with Linen Thread before the layers were adhered to the card base, a 4 1/4″ x 11″ piece of Solar White cardstock, folded in half. Three black Rhinestones were adhered to the top right to finish off the card. Sorry I am so late posting today. While I was good about participating in this week’s challenges at Splitcoaststampers, I was horrible at writing my blog posts for my creations. I created this card for both Monday’s Technique Challenge (create your own polka dots) and Monday’s CAS challenge (sketch). I started by cutting Neenah Solar White cardstock and patterned paper from BBP All Hallow’s Eve with MFT’s Cameo die-namics die. Next I stamped the frame of the matching set in Jet Black Archival ink over the patterned paper frame. 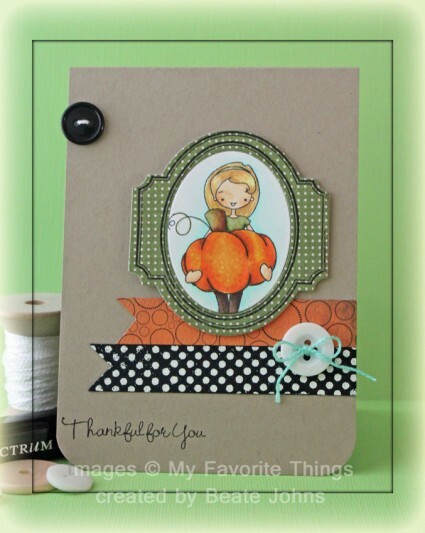 The image from Sweetest Pumpkin in the Patch was stamped in Tuxedo Black Memento Ink and was colored with Spectrum Markers (Skin: FS2, FS3, TN2 Pumpkin: GB5, OR1, GB7, G10 Stem: DG2, TN2, GB7, GB10, TN7 Shirt: DG2, DG4 Pants: EB7, EB8 Hair: CT2, TN2, GB8 Background: BT1, BT2). The card base is a 4 1/4″ x 11″ piece of Kraft cardstock folded in half. The bottom corners were rounded. A 5/8″ x 3 1/4″ piece of BBP All Hallow’s Eve paper was adhered to the lower right hand side of the card. A 5/8″ x 3 5/8″ strip of black cardstock was stamped in the polka dot background from MFT’s By the Numbers stamp set with Distress Embossing Ink and embossed with white embossing powder. The black strip was adhered underneath the patterned paper strip. Two buttons were added with embroidery thread to dress up the card. I didn’t have the right color thread for my white button, so I colored with the the BT1 Spectrum Noir Markers. The image layers were adhered slightly over the paper strip with foam adhesive squares. A sentiment from the Sweetest Pumpkin In the Patch was stamped on the bottom left of the card to finish off the card. Thanks so much for stopping by! Have a wonderful Saturday.